On Saturday, March 23, Hozier performed at the Coca-Cola Roxy in The Battery Atlanta as part of his “Wasteland, Baby!” North American tour. The recent release of the artist’s sophomore album on March 1 brought huge crowds to the area to witness the Irish singer’s renowned voice. Entrance lines for the door were already snaking throughout the venue’s sidewalks an entire three hours prior to the concert, and many found themselves outnumbered by dedicated fans who had camped out at the venue. The night kicked off with an opening performance by Jade Bird, a twenty-one year old artist from England. Her one-woman performance was especially well received by the audience, and the liveliness of her on-stage presence resembled that of similar one-man-show style act Ed Sheeran. Bird opened with her popular single “Uh Huh,” and fans were immediately struck by the unexpected power in her voice as she entered the song’s first chorus. The receptive shock of Bird’s notable talent did not fade as she continued with her set. Audience favorites included her “Love Is All Been Done Before,” “Lottery” and “I Get No Joy.” Her sweet yet equally sassy attitude was apparent in her lyrics about ex-lovers, and this reflected certain earlier works of the hugely successful Taylor Swift. After a short wait, Hozier’s British- and Irish-based band took the stage and was welcomed by thunderous applause. The singer sported a shirt scrawled with the name Mavis Staples across the chest, a nod to his work with the influential R&B artist in “Nina Cried Power,” the first single belonging to his 2018 EP of the same name. Hozier’s set opened with “Would That I,” a stunningly powerful love ballad. The homely effects of the song’s acoustic-based instrumentals mixed seamlessly with the down-to-earth nature of the Roxy. The sold-out crowd of 3,600 was made mostly of standing-room-only audience members on the main floor. Nonetheless, those who had balcony seats were soon on their feet once the set progressed through songs such as the upbeat “Jackie and Wilson” and an acoustic version of “Someone New,” both pieces from Hozier’s 2014 eponymous debut album. Throughout the entirety of the set, the singer made it quite evident that his voice is in no need of doctoring; the live performances nearly matched the exact sounds of the produced versions, and Hozier consistently hit numerous challenging notes with little to no visible effort. Ultimately, large credit should be awarded to Hozier and his crew for placing the focus of the concert on the music itself instead of flashier visual effects. The set demonstrated the band members’ talents through an emphatic inclusion of lengthier instrumental pieces by skilled organists, violinists, and guitarists. During the time between songs, Hozier discussed with the audience the Doomsday-based aura of certain songs and their lyrics, hence the album’s title. His lighthearted attitude towards ideas relating to the end of the world were reflected in the songs’ velvet background vocals and sanguine synth notes. As the set neared its close, audience members were greeted with the fan-favorite “Movement,” a soulful and lustful call to an all-consuming lover. Lastly came the familiar hit “Take Me to Church,” which earned multi-platinum recognition across the world in 2014. The night closed with the bittersweet encore of “Cherry Wine,” masterfully picked by Hozier on his acoustic guitar, and the band later joined him to perform “Work Song” before taking their final bows. 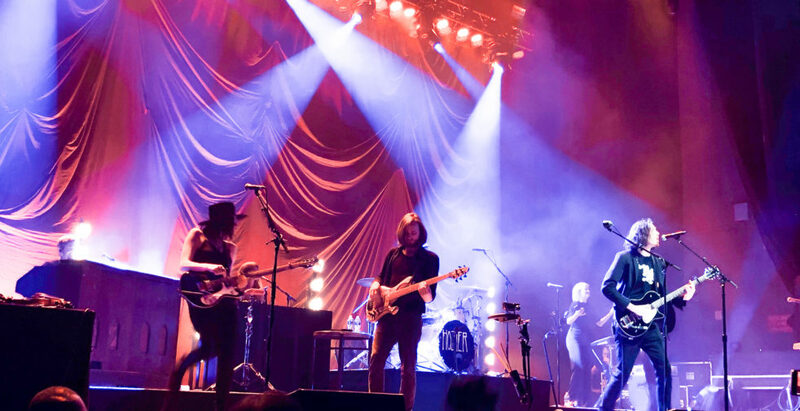 This loving end to the night resembled the ambience of Hozier’s greater works, and many fans were seen to be standing in tears as they soaked in the beauty of the night’s performances. Hozier will continue his North American tour as the year progresses, and with a whopping number of shows already sold out, he will undoubtedly continue to be met with adoring sold-out audiences in celebration of his remarkable talent.